Kids Math Teacher: New M.a.Th. with Toy Cars & Sneak Peek at Trouble with Monkeys! New M.a.Th. with Toy Cars & Sneak Peek at Trouble with Monkeys! What kind of hands-on math activities are you doing with your kids? Have you ever used toy cars in your classroom? Also, I'm super excited to give you a sneak peek into my upcoming project! 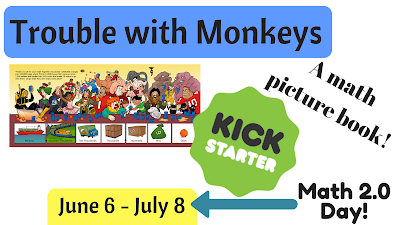 On June 6th my Kickstarter campaign goes live! If you want to look at it here is the link to the planned campaign! It will only run through July 8th (Math 2.0 Day) and the more eyes and backers I have on it at the beginning will be great! Labels: #math, 1st grade math, children's book, Kickstarter, Kindergarten math activity, M.a.Th.